Spacious, Sunny, Open Floor Plan! Plant Shelves & Niches, Cathedral & Trey Ceilings, Rounded Corners, Hardwd Flooring, Ceramic Tile, Xl Windows, 2 Fp's. Loads Of Counter Space In Kit W/Pantry, Lg Fin Walkout Ll W/4th Non Conforming Br Or Den/Exercise Rm + 3/4 Ba. New Pella Sliding Door & Carpet In Ll Den, Fenced Yd, Oversized Treated Deck, Washer/Dryer Stay. Home Warranty Paid By Seller. Great Location-Short Walk To Market Pointe & La Vista Sports Complex! Close To Pap/Lav Schls. 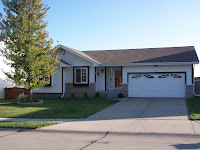 Visit www.HuskerHomeFinder.com or call Angela May direct at 402/333-5008.